Matt Godden could be back in the Posh starting line-up against Rochdale. Peterborough United could change a winning formation as they seek to improve their form at the ABAX Stadium at home to struggling Rochdale tomorrow (January 12). Posh impressed in a 4-2-3-1 system when beating Chelsea Under 21s in the Checkatrade Trophy on Wednesday (January 9), but a Dale team leaking goals galore might persuade manager Steve Evans to tweak that line-up. Posh skipper Alex Woodyard applauds the visiting fans after a 4-1 win at Rochdale in August. Dale have conceded 17 goals in their last four outings, a run that has prompted manager Keith Hill to recruit powerful centre-back Ethan Ebanks-Blake on loan from Wolves in time for tomorrow’s game. That form has tempted Evans into considering a second striker alongside in-form top scorer Ivan Toney with Matt Godden the favourite to come in. Skipper Alex Woodyard and recent signings Kyle Dempsey and Ben White are also available after missing the win at Stamford Bridge. Evans also has a decision to make about on-loan Lee Tomlin who remains short of match fitness after playing for just 45 minutes against Chelsea. “I might tweak the formation,” Evans admitted. “I am mindful that we played very well at Chelsea, especially in the second-half, but a home game against Rochdale presents different problems so we tried a couple of things in training today, including the involvement of a second striker. Lee Tomlin in action for Posh at Stamford Bridge. “Nothing beats competition for places and we have plenty of that right now. We have a lot of talented and creative attacking players and we have an abundance of good midfielders, but every single one of them also has to appreciate the need to work hard as well. “We have worked on getting the ball to feet all season and we have players in our squad who can only play that way now, but Rochdale will be tough to beat. “We won easily at their place in the end at the start of the season, but only after thay had scored first and we had rode our luck to stay in the game. Hill has also brought in Manchester United youngster Ethan Hamilton, a versatile performer who can operate in midfield or defence, on loan. Evans confirmed Posh have received offers of loan and permanent moves for several players. He also confirmed veteran defender Sebastien Bassong will leave the club at the end of the month. He made just one starting appearance for Posh. Midfielder Mark O’Hara is unlikely to be involved tomorrow as he mulls over a possible move to League Two leaders Lincoln City. 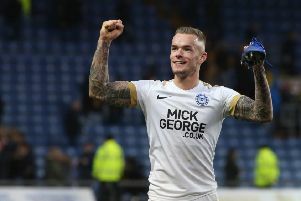 It’s a must-win game for Posh tomorrow as they take on promotion rivals Luton (away, January 19) and Charlton (home, January 26) in their following two League One games. The current form table for League One shows how much ground Posh have lost on their promotion rivals in recent weeks. Six of the the top seven in League One are also in the top seven of the current form table based on the last six matches. Posh are the exception as they languish in 17th place with just one win and six points. Luton, who top the current form table, have gained eight further points on Posh in this period. Doncaster and Sunderland have gained seven points on Posh in the last six League One matches, while Sunderland (7pts), Charlton (6) and Barnsley (5) have also left Steve Evans’ men trailing. Rochdale, are in even worse form than Posh with just five points from their last six matches.